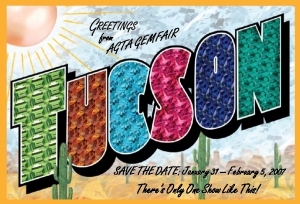 Following the holidays, make your plans for the world’s greatest gem and mineral show in February. Pala International will be represented, as follows. Mike Wise (above left) a Geologist at the Smithsonian National Museum of Natural History, with Jeff Post, the museum’s Curator-in-Charge. 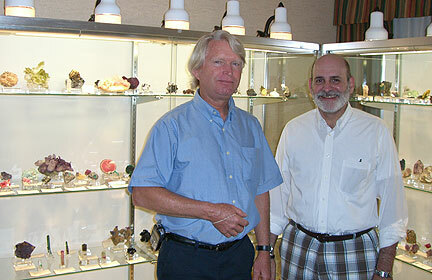 Below, Pala International’s John McLean with Palagems.com webmaster David Hughes, in the Pala sales room at the 2006 Colorado Mineral & Fossil Show. As we reported in our Gem News two weeks ago, Pala’s own Gabrièl Mattice attended the opening of the Lester and Sue Smith Gem Vault, the newest permanent exhibition at the Houston Museum of Natural Science. For the past three years, Gabrièl has consulted as an advisor in the procurement of the new collection. 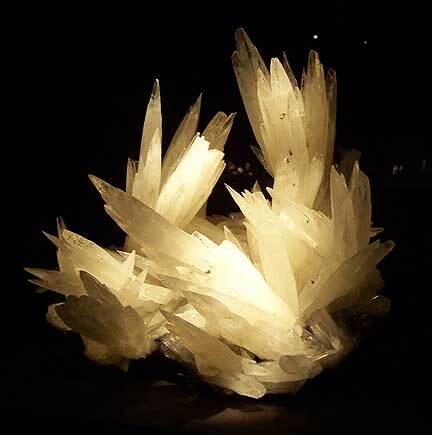 Calcite cluster with jagged intertwined crystals pointing in every direction. Rhodochrocite specimen with large cubic crystals on a matrix of tetrahedrite and quartz. 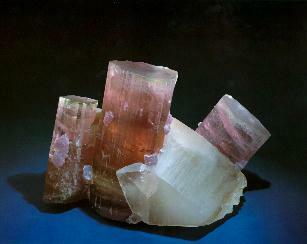 Spodumene group showing the variation of colors, from the pink hue of kunzite to some more unusual color combinations. Emerald crystal with calcite and mica from North Carolina weighs in at a record-setting 1,869 carats. Rhodochrocite—another striking example of nature’s ability to produce such a pure color. 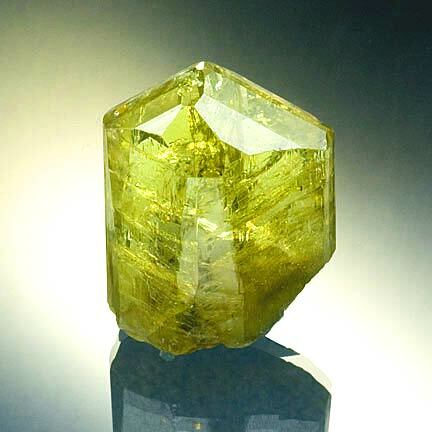 In this edition of Mineral News we feature natural yellow zoisite from the Merelani Hills of Tanzania. 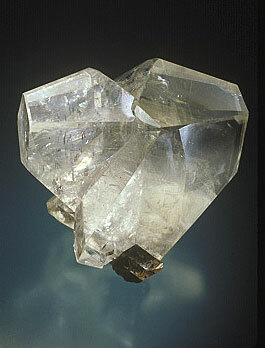 The first is a well formed crystal with an excellent multi-faced termination. 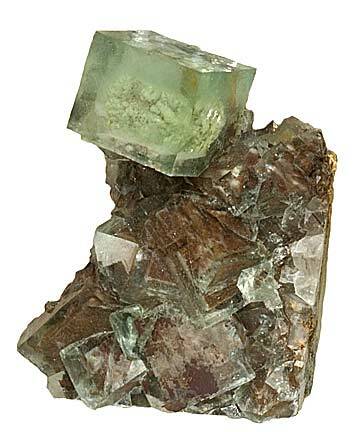 The overall shape of the crystal follows suit for tanzanite, yet the color is quite unusual for zoisite, with hints of of green and gold shining through different axes. A great specimen to complement any tanzanite collection showing the unusual colors of zoisite. Price: $4,200.00. Our second featured item is a rough & cut yellow zoisite pair. This interesting pair shows another side of zoisite. The rough piece has a nice euhedral shape, excellent termination, and the upper third of the crystal is very gemmy, making it a superb specimen. 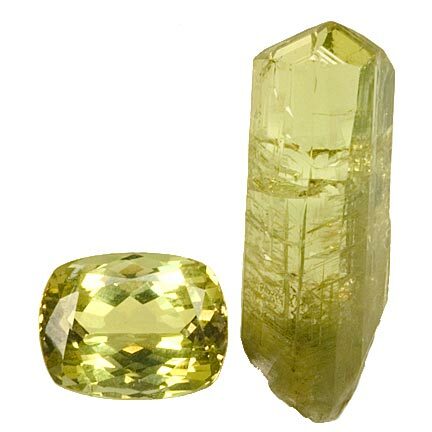 The faceted gem is a pleasing cushion shape showing blends of yellow and green. The couple is well priced for $6,400. A serendipitous find in the Colorado high country brings a lone collector down the mountain with a North American record. Steve Brancato found this colossal aquamarine specimen near the summit of Mt. Antero in the Sawatch range of Colorado. Brancato was excavating a pocket when “out rolls a little 25-carat gemmy, a really nice blue aquamarine. I knew I was into something else, obviously,” he recalled to the Denver Post, later naming the find “Diane’s Pocket” in tribute to his mother. Brancato extracted the cluster piecemeal over the next three days. After two weeks of hauling 1,000 pounds of material down the mountain, the specimen was eventually reconstructed, from fragments, to its full stature, now measuring 37 by 25 inches and weighing 100 pounds. 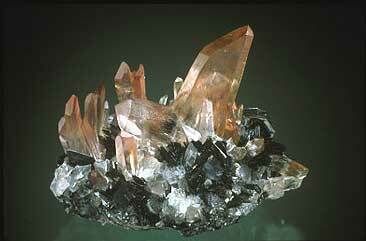 The cluster contains white feldspar, silvery mica, red garnets, black quartz, and over 100 aquamarine crystals. Azurite specimen (Bisbee, AZ) from the special exhibit. 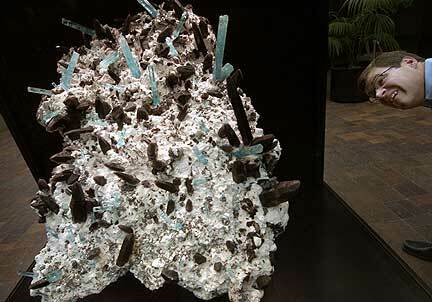 This year’s special exhibit is titled “Masterpieces: Rembrandts and Picassos of Nature.” It will include a 2000-ct. topaz and the biggest emerald crystal of North America, courtesy the Houston Museum of Natural Science. By Marcus J. Origlieri, Ph.D.
Will Larson (right) distributes Pala International’s Minerals from Japan reprint to Japanese mineralogist attendees. The International Mineralogical Association (IMA) formed in 1958 to “further international co-operation in the mineralogical sciences and to promote wider community awareness among international groups having Earth Science interests.” The association currently has members from 38 different countries. 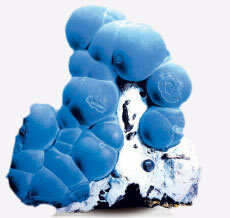 The work of the IMA includes the operations of the Commission of New Minerals Nomenclature and Classification (CNMNC). The CNMNC sanctions the publication of new mineral names and decides on the appropriate nomenclature for minerals. The IMA holds a General Meeting every four years; this year the meeting took place in Kobe, Japan. The opening ceremony of the meeting, held in July, included a personal message from Prime Minister Junichiro Koizumi. In honor of the meeting, schools in the Kobe area had a special “mineral appreciation” day. 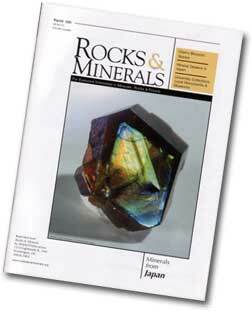 Two new publications on the mineralogy of Japan appeared during the conference. The first of these was published through the auspices of Pala International (see previous Mineral News). This publication, entitled Minerals from Japan, consists of a collection of reprints published in the Journal Rocks and Minerals. 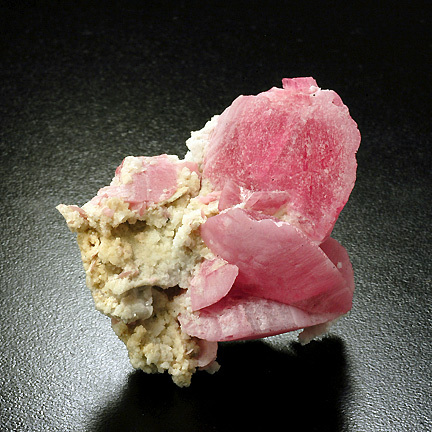 The articles discuss mineral collections, mineral shows, and field collecting in Japan, by John Rakovan (University of Miami, Ohio), Masao Kitamura and Osuma Tamada (Kyoto University), and Alfredo Petrov (Peekskill, New York). The second publication, prepared by Satoshi Matsubara and Ritsuro Miyawaki, is titled A Catalogue of Japanese Minerals (Tokai University Press). 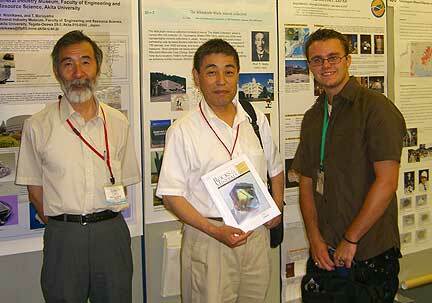 Both these authors work as mineralogists at the National Science Museum in Tokyo. 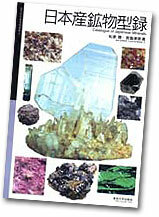 Matsubara began publishing catalogues of the mineral species of Japan in 1982. This book is the sixth edition, the first to be illustrated. Dr. Matsubara has issued numerous publications on topographic mineralogy of Japan, and for these contributions collaborators have named matsubaraite in his honor. 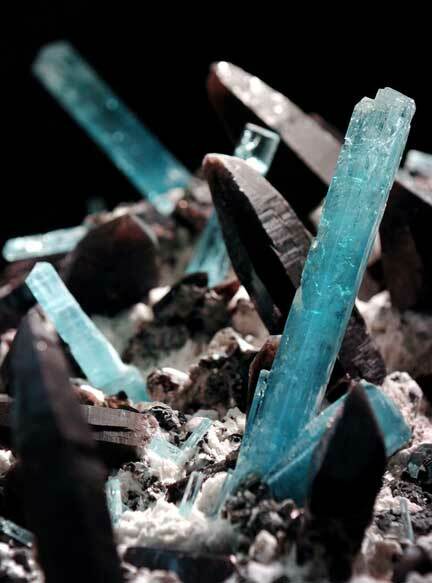 The second author, Dr. Miyawaki, solves crystal structures of minerals, and has participated in the description of several new minerals from Japan. 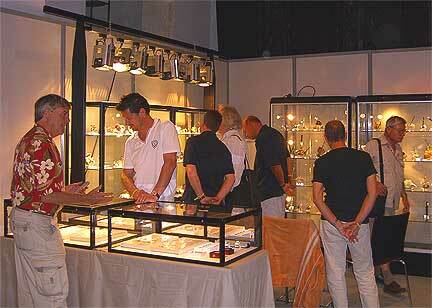 There were many contributions of interest to the mineral collector and gemologist. Frank Hawthorne (University of Manitoba, Winnipeg) presented a talk about amphibole nomenclature, wherein a group of IMA members is proposing a new nomenclature. 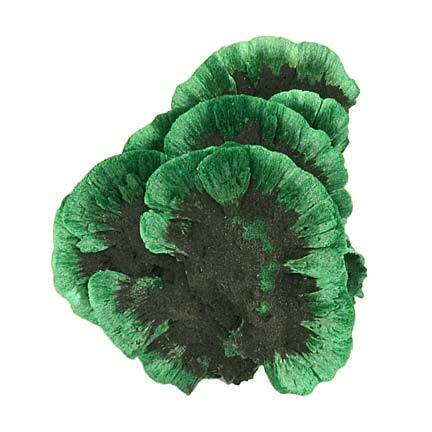 This has an effect on the naming of certain gem materials, especially tremolite, actinolite, and pargasite. 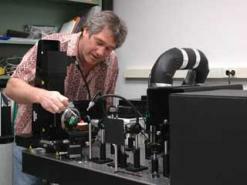 Professor Downs from the University of Arizona discussed the RRUFF Project (see our story below), which intends to obtain Raman spectral data for the entire mineral kingdom. The data collected for this endeavor is available to the public at www.rruff.info. 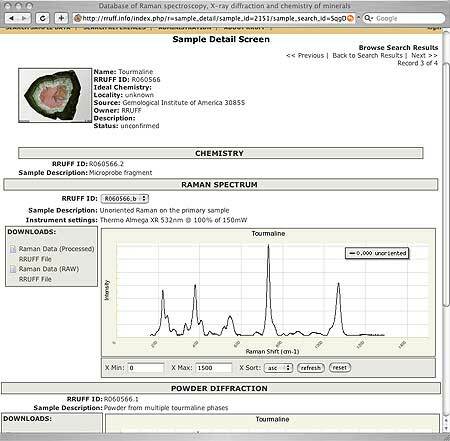 These data enable the rapid identification of gems and minerals with a Raman spectrometer. 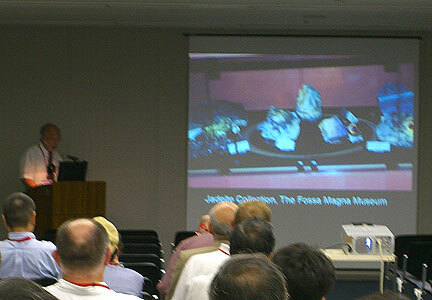 A session on gemstones began with a paper by Dr. James Shigley of the GIA on “HPHT-treated colorless and colored diamonds,” indicating that spectroscopy enables the distinction of treated from untreated stones. Emmanuel Fritsch discussed a specific mechanism of brown coloration in diamond. In an interesting talk on emeralds, Carlo Aurisicchio indicated that trace element chemistry allows determination of emerald origin. The session culminated in a talk by Ahmadjan Abduriyim on LA-ICP-MS analysis, which allows the detection and quantification of beryllium diffusion in corundum. The full list of scientific sessions is available. The next General Meeting will be held in Budapest in 2010. The exhibition is another in a series that has featured amber, diamonds, and pearls. On display will be some of the finest natural specimens culled from museums here and abroad, including the Natural History Museum–London’s 1.6-lb. Latrobe Nugget, the Golden Horn, and the Dragon, a delicate dragon-shaped specimen of matrix gold from California’s Colorado Quartz Mine. 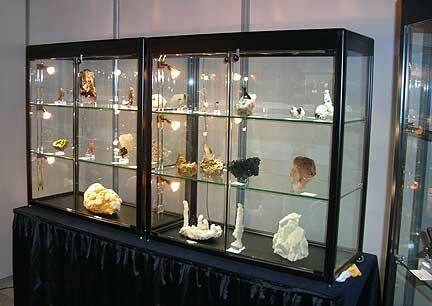 In this edition of Mineral News we feature two small, exquisite cabinet specimens. 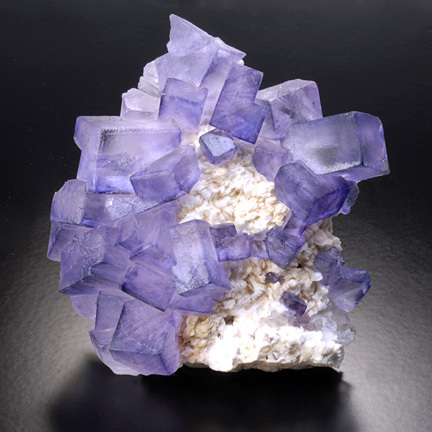 Our second featured piece is a vivid Moroccan fluorite on barite. This wonderful, bright, unusually colored specimen is very different from most Moroccan fluorites we have seen. 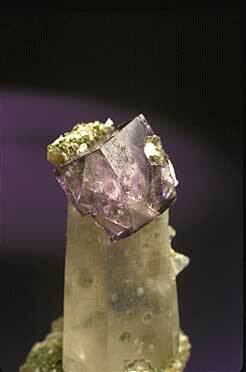 Mined in 2004, it comes from the Taourirt Mine (near Taourirt, 108 km. south of Oujda, in the Oriental Region). It is very well priced at $400.00. Pala International President Bill Larson and son Will Larson are preparing for their presentations this month to the 1st International Minerals & Gem Crystal Conference and Exhibition, China (as reported in our last issue). In this edition, we give you a preview of their talks—extended abstracts that make for engaging reading. 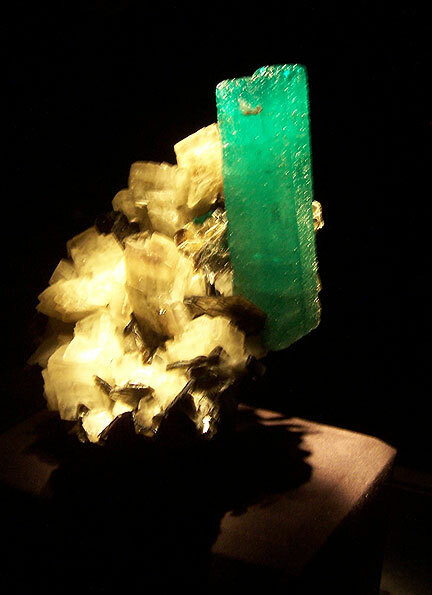 Bill’s topic is Tourmaline: Including the connection of San Diego Tourmaline Mines and China. He tells a brief history of tourmaline and its characteristics, discusses the phenomenon of paraiba tourmaline and Pala International’s mining history, and finally, recounts the tale of how a Chinese monarch’s passion for colored stones kept Southern California miners busy. Will Larson takes on a topic prized by any collector who began at an early age: What collecting minerals means for the youth of China and America in the 21st century. He discusses reasons young people collect, ideas behind what to collect, building a collection, and the prospects for collecting Chinese minerals at this time. Data search. 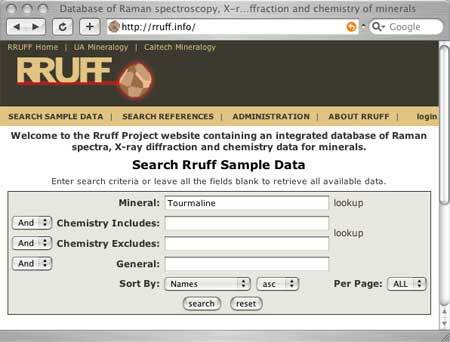 Screenshot of the RRUFF™ data lookup form. The database work is being performed by research groups of Drs. 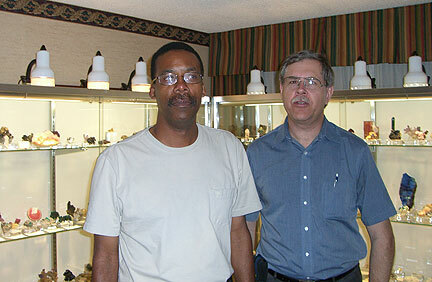 Robert T. Downs, M. Bonner Denton (UA Departments of Geosciences and Chemistry, respectively), and George Rossman (Caltech Geological and Planetary Science). The project is being sponsored by gemstone connoisseur Michael Scott. In July, Richard Hughes, Vincent Pardieu, Dana Schorr, and Guillaume Soubiraa ventured to Tajikistan to see for themselves the source of rubies appearing in Bangkok and being offered by email from Uzbekistan. 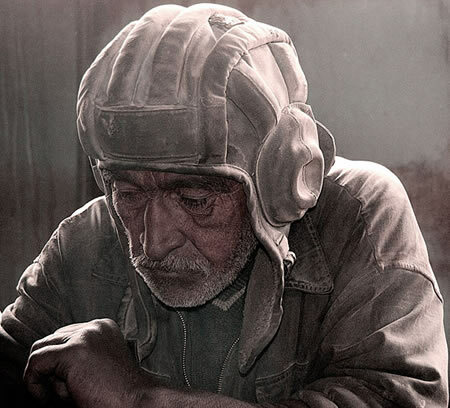 Their travels and bureaucratic travails take us from the relative European splendor of the capital Dushanbe, to Khorog (headquarters of the restricted spinel mining area), to the Kuh-i-Lal mines—some of the oldest in the world—on the Panj River at the Afghanistan border. What they’d heard, however, didn’t jibe with what they saw: no red spinel. Then east on the Pamir highway, bedding down with (well not with) Kyrgyz hosts in what Hughes calls “Yurtisan” (after the portable dwellings—complete with East Coast-style radiators), and on to Murghab and the ruby mines of Snijnie on the Chinese border. They were not disappointed this time. While they were denied viewing or purchasing samples, they saw evidence of ruby in the marble matrix, and were told that the largest fine crystal was 200 grams. Then back to Dushanbe (via the Wakhan Corridor—and Kuh-i-Lal), and after much haggling with the mysterious “Gubjemast Company,” finally to view ruby samples. 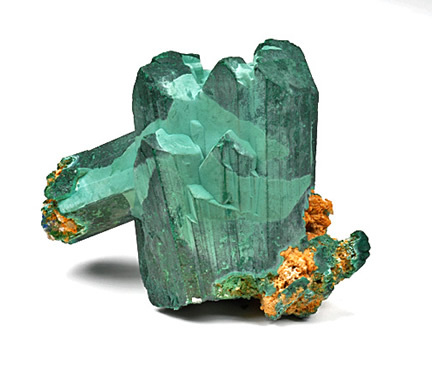 Readers of the Tajikistan tale above may be interested in Vincent Pardieu’s three-part report (penned with Richard W. Wise) on the mines of Madagascar: ruby, sapphire, and touching on tourmaline and emerald. Part 3 has just been posted on Colored Stone’s website. According to Pardieu, we ain’t seen nothin’ yet. He concludes the article with a bold estimation, which we can’t help but quote in full. Geologically speaking, over 80 percent of the island could hold ruby and sapphire deposits. In less than 10 years, six ruby and sapphire deposits of different types have been discovered, but there is more to come. Madagascar has twice the gem-producing area of Myanmar and Sri Lanka added together: If the famous Mogok area in Myanmar or the Ratnapura area in Sri Lanka are a total of 50 km by 50 km (31 miles by 31 miles), Ilakaka is more than 300 km by 300 km (186 miles by 186 miles). And after only six years of production, Ilakaka is far from fully exploited. The potential in the jungle-covered areas of Vatomandry and Andilamena looks similarly enormous. 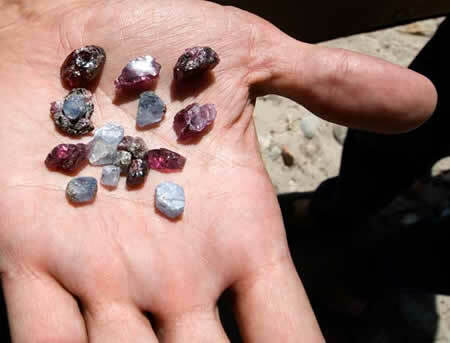 There are new reports of alluvial rubies and sapphires being found in the deep, rain forest-covered mountains east of Andilamena up to Fenoarivo. 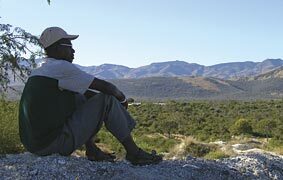 Other potential mining areas exist east of the Fianarantsoa corundum deposits, and are also known in the south near Bekily, Ejeda, Betroka, and Ikongo; in the north near Andapa, Ambilobe, and even in the tourist paradise island of Nosy Be, where attractive purple sapphires have been found. UC Berkeley mathematician Stephen Smale is known worldwide for, among other things, his theory of how to turn a sphere inside out. 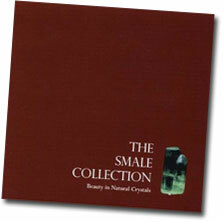 But Smale and his wife, Clara, also have an interest in the material world, as evidenced by the recently published book, The Smale Collection: Beauty in Natural Crystals. 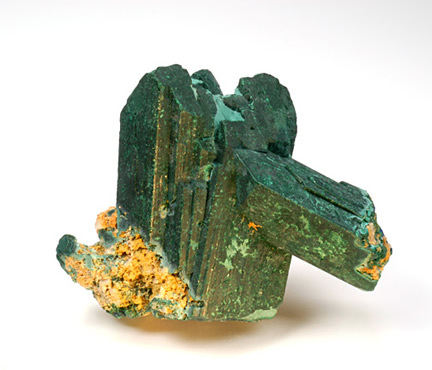 Featuring 70 plates by photographer Jeff Scovil and 30 by Smale himself, the book includes specimens obtained from Pala International’s Bill Larson, such as the tourmaline pictured below. We’ve added several new specimens obtained at the Sainte-Marie-aux-Mines show. Dealers at Bogyoke Aung San Market claim that “[s]ales of crystals in Yangon have steadily decreased since the market boom of the early to mid 1990s,” according to a Myanmar Times article posted earlier this summer. Crystal wholesaler Ko Myat Toe, of Crystal Hunter, cited a number of reasons: lack of supply, higher prices, and fewer buyers. Sales to foreign buyers, critical to the market, have fallen off, especially since the 9/11 attacks on the U.S. Welcome to this new edition of Mineral News From Pala International! Sign up for the email version. We’re pleased to offer you the first edition of our revamped Mineral News. This will be a bi-monthly newsletter, delivered the first week of even-numbered months. We’re open to suggestions and tips for stories, so don’t hesitate to send us feedback. Pala International President Bill Larson will present at this year’s Gemological Institute of America Symposium, to be held August 27–29, 2006. Larson will share a panel with Lore Kiefert (AGTA lab director) and Christopher Smith (GIA NY lab research manager), moderated by Gary Roskin (Jewelers’ Circular Keystone Senior Editor). In time for the Symposium, and extending through November, GIA will unveil a new display setup in the rotunda of the main building of its Carlsbad campus. The inaugural exhibition, “Celebrating Excellence in Gems and Jewelry,” will include “super fine” local tourmaline and Burma ruby crystals from the collection of Pala’s Bill Larson as well as a centerpiece display by Symposium Premier Sponsor The Steinmetz Group, according to GIA sources. The display system will use state-of-the-art fiber optic lighting, said the sources, and the exhibition’s “excellence” will merit the publication of a catalog, something rarely done by GIA. 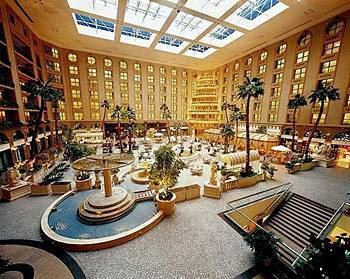 Lobby of Beijing’s Tianlun Dynasty Hotel, site of the Chinese conference and show. Pala President Bill Larson and Bill’s son, Will Larson, are among the thirty international speakers slated to present at the 1st International Minerals & Gem Crystal Conference and Exhibition, China. 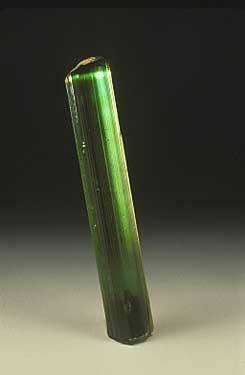 Bill will speak on tourmaline, one of the great gems of world. He will discuss California production, including the California–China Connection. Will’s topic will discuss what collecting minerals means for the youth of China and America in the 21st century. The show’s sponsor, AAA Minerals International, offers purchasing-tours and locality/mine visits, and thus offers two optional mining area tours in Hunan Province before and after the October show. For our “revival” issue of Mineral News, we’re excited to offer a single kunzite crystal along with a pair of aquamarines (priced separately). 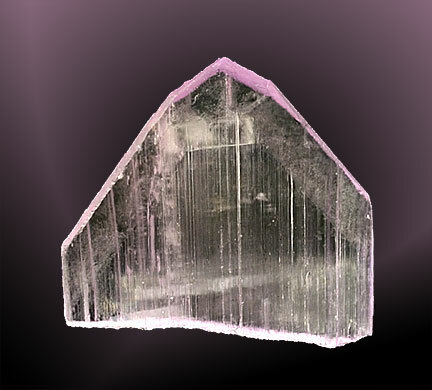 This is a classic-form kunzite (above), from Paprock, Afghanistan. It is a complete, wonderful single crystal with no damage. Even the base is complexly terminated. The color is fine pink-purple down the “C” axis. Note the extra-sharp faces at the top of the crystal. An excellent cabinet specimen. Price: $2800.00. 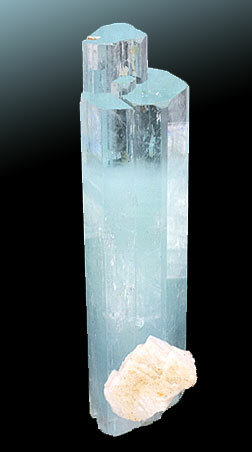 Above, an aquamarine from Shigar Valley, Pakistan. A beautiful and perfect specimen, with good color and proportions, doubly terminated. Brought to us in Sainte-Marie-aux-Mines directly from Pakistan by a good friend of Pala International. Price: $2400.00. 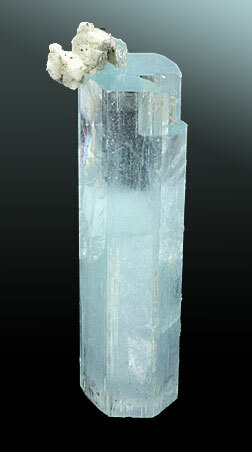 A second aquamarine from Shigar Valley, Pakistan. As with the above specimen, this is an exquisite, undamaged, doubly terminated specimen, delivered to us in Sainte-Marie from Pakistan by our friend. Bill Larson: “I love the termination complexity with the single rising above the base termination by a centimeter or so.” Price: $2400.00. Last month we at Pala moved part of our operation back into the “back room,” a 488 square-foot renovation that made spacious use of unused storage space at the rear of the building. See the full story. 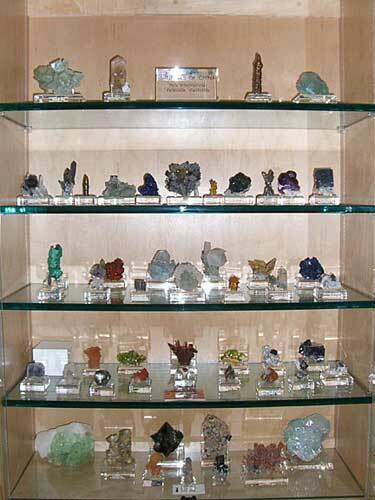 Fifty-three-piece Chinese mineral collection displayed in Pala International’s remodeled office. This show remains one of my favorites, nestled in the charming village of Sainte-Marie-aux-Mines, in the Valley of Silver (val d’Argent), near Strasbourg, France, and in the middle of the Alsace wine region with charming restaurants featuring foie gras and other local specialties. Is there anything else missing? 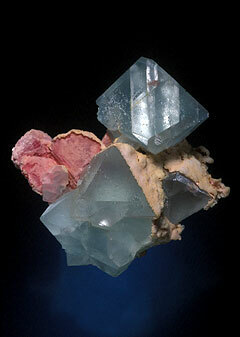 Oh yes: mineral specimens and gems. These are showcased by 650 international mineral dealers and 350 gem and jewelry dealers in booths filling two sections of the town’s streets and in several indoor halls. What the...? 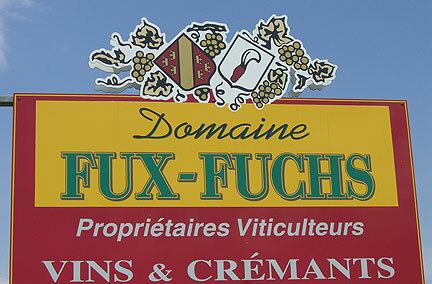 This sign proclaims Fux-Fuchs to be a vintner of Crémant d’Alcace, a delicate sparkling wine, cousin to the region’s better known Gewürtztraminer and Riesling, and the leading sparkling wine on the French domestic market. I am traveling with my son, Will, and Mark Kaufman, a fine gem cutter and dealer from San Diego. The three of us were able to split up and cover a great deal of the show in a short period of time, catching whatever new was put out in the first days. 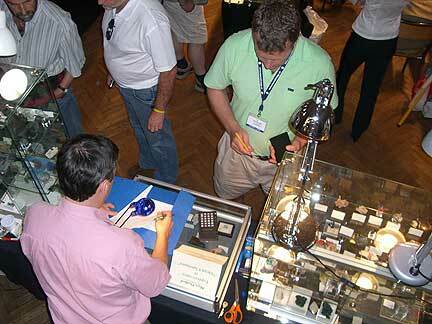 Of course, to see finer things one must know the dealers, and then you’re shown things privately as in the USA. No cheap theatrics here. 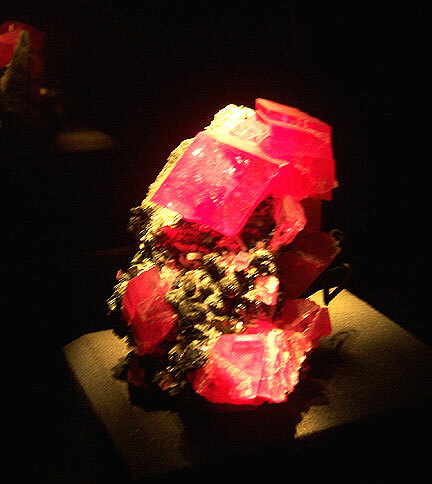 A typical mineral display in the theatre at Sainte-Marie-aux-Mines. 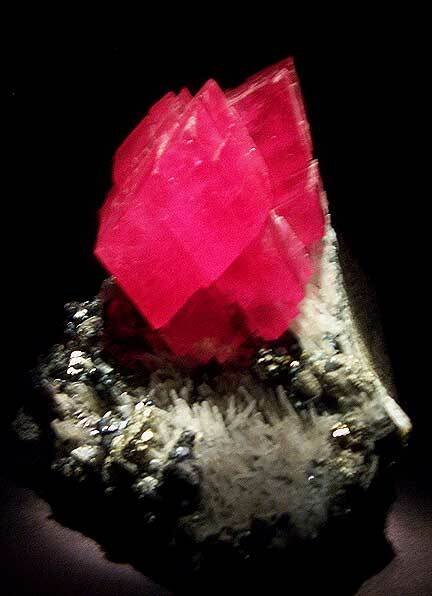 A rubellite pocket found two years ago in Luc Yen, Vietnam, was on display and priced for the first time. 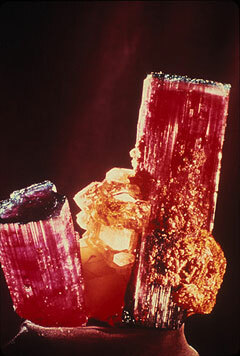 These tourmaline specimens were also featured in the current issue of Lapis magazine (see below), with the best matrix piece featured on the cover. 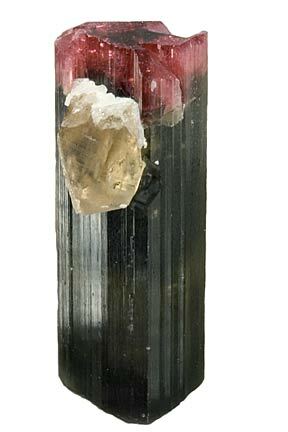 This piece was excellent; it was repaired, as most larger tourmaline matrixes are, and sold on the first day. A bold debut. 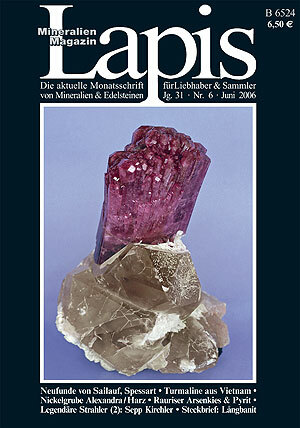 Exhibited at the Sainte-Marie-aux-Mines show was the tourmaline matrix specimen pictured on the cover of the June 2006 Lapis magazine. Among the fine things we saw were many new, small, but beautiful aquamarines from Shigar Valley (Pakistan). And a few select kunzites from Paprock, Afghanistan, as well as many nice tourmalines from Afghanistan. Mark found a great selection of purple scapolites from Tajikistan that were excellent single crystals, but will probably be sacrificed to the cutting wheel due to the increased sums gem collectors will pay. Talking turkey. Pala’s Bill Larson (left) discusses the quality of last evening’s foie gras with known connoisseur Marcus Budil—and today’s mineral purchases. Inside the theatre—many downtown buildings, including this one are used for the show—are clustered the top-quality mineral dealers, mostly from European countries. This year the theatre’s stage had been selected for dealers with finer pieces, and so the tone inside the theatre was raised a notch. 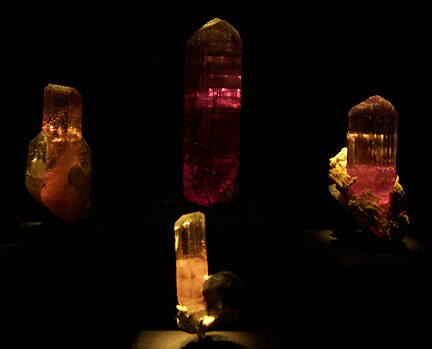 Next year it is rumored that the genius who conceived and owns the show, Michel Schwab, is going to upgrade the theatre even more to highlight the finest minerals available. He also had a few displays of interesting exhibits, including fine French fluorite specimens; I hope he will expand this excellent idea. Class act. Looking down on Alain Martaud’s booth from the stage in the local theatre that serves as a marketplace for top-quality minerals, most from European countries. The show was great, but not easy to find many things for a dealer, as prices were high due to the strong euro and generally higher prices than in producing countries. Minerals from Japan, available from Rocks & Minerals is a 40-page illustrated reprint of recent articles by John Ravokan (Dept. of Geology, Miami University, Oxford, OH). The reprint can be ordered from Rocks & Minerals, 5341 Thrasher Dr., Cincinnati, OH 45247, USA. The cost is $8 postpaid to US addresses, $14 outside the US. There is no online order form. 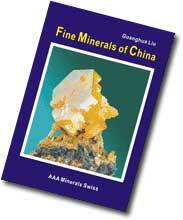 A new book, Fine Minerals of China: A Guide to Mineral Localities, by Guanghua Liu, has just been released. Fully illustrated, with 600 photographs and 55 maps, it includes photos of several specimens from the collection of Pala’s Bill Larson, as shown below. Some of these specimens are included in a beautiful fifty-piece Chinese Collection (on handsome Sunnywood mounts) displayed at The Collector Fine Jewelry. The book is published by AAA Minerals, owned by the author. The company is the sponsor of the China mineral show in the news item above. The book’s material covers 60 localities in 13 provinces, 45 location descriptions, and data on 399 meteorites, 116 types of minerals, and 420 potential deposits. It is available from the publisher. Jeffrey Scovil, who photographed the Pala specimens shown here, wrote this account of his travels with Dr. Liu in Hunan Province in 2004, published in Rocks & Minerals. Guanghua Liu, PhD is a coal geologist and mineral dealer originally from China, now residing in Tübingen, Germany. He owns the consulting and trading company, AAA Minerals International. Dr. Liu has an academic career spanning nearly 30 years, graduating from Jiaozo Mining College, then receiving his Masters Degree in Coal Geology and Sedimentology from China University of Geosciences, at which he became associate professor, finally receiving his doctorate in Geology from Tübingen University, where he joined the geological department’s scientific staff. Widely published, Dr. Liu is guest professor at China University of Mining and Technology and China University of Geosciences in Beijing. Dr. Liu was co-recipient, with Berthold Ottens, of the Friends of Mineralogy 2006 Award for Best Article 2005, for a collection of articles on Chinese mineral localities (The Mineralogical Record, 36:1, pp. 4–80). As a preliminary reference work on these localities, this chapter is invaluable: I suspect it is typical that, of the three Chinese calcites in my own collection, two of them came with locality attributions totally unlike the ones given here for what’s obviously the material shown in the photos. © 1999–2015 Pala International; all rights reserved. Users may download this information for their own private, non-commercial use. Any other reproduction of this document (text or graphics) without the express written consent of Pala International is strictly prohibited. Please see our disclosures. All items subject to prior sale. • Problems? Praise? Contact the Webmaster.